Elephant impressed me as soon as it started. Being a Gus Van Sant fan, I knew I would enjoy the film but I must say the cinematography was beautiful. Vast scenes of silence and normality get torn apart with violence that is unexplainable. Based on the events of the school shootings, the story takes place in a suburban town at a local high school. The camera takes you through several of the students day to day while also letting you inside the life of the shooters. Van Sant took an interesting turn with the story and enabled the viewer to feel for the main suspects of this horrible crime. I must admit, Alex was my favorite character. Although sad, the film is gorgeously created. Astounding shots are captured and due to the long scenes, you obtain a feeling of calm and anxiety at the same time because you know something bad is going to happen. Truly suspenseful to say the least. The imagery captured my heart while the story slowly saddened it. A duality of emotion that is quite disheartening. All in all, a film you must not miss. The color palette is simple and realistic, one we all are accustomed to seeing every day. 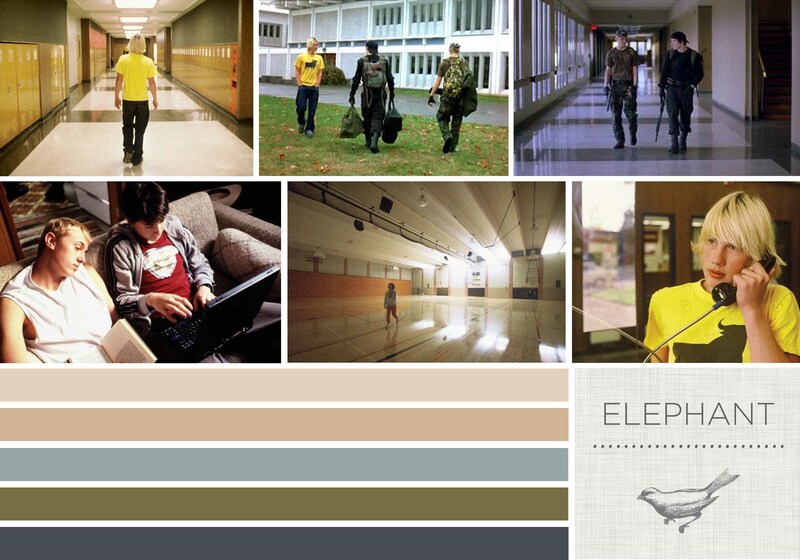 Walking outside, attending classes in school, hanging out at the lockers with friends, the everyday palette is perfect for the film. And then at times, the lens will stay on the sky and it will look like the bluest in all the galaxy. A bit of beauty in an everyday mundane world.